Whistles Luna Bodycon Size 12. Never worn. There is an issue with the lining which it had when bough - it would need to be taken up. Wouldn’t cost much. Lovely print perfect for day and night. A sleeveless floral dress in a size 10. Has an elasticated back, the top half of the dress has a wrap over style and it comes with a belt. It is made of cotton making it ideal for Summer or holidays. Thank you for looking. This beautiful JOE BROWNS Dress has a multi coloured floral design on a navy blue background. The dress has a deep cross over V neckline and short sleeves. The material is soft with stretch for comfort and fit! PLEASE check measurements below before bidding as I do not accept returns. Measurements armpit-armpit 19" unstretched Length from shoulder seam 39" From a smoke and pet free home Sorry UK deliveries only Payment within four days of winning bid PLEASE! PLEASE only bid if you intend to pay. THANK YOU FOR LOOKING PLEASE CHECK MY OTHER ITEMS AND BE LUCKY! Size 22 XL green velvet dress from M&Co, beautiful dress, stretchy and flattering wrap effect. Very good condition. Three quarter length sleeves. Missguided Dress Size UK 8. Condition is new without tags but in perfect condition. Dispatched with Royal Mail 1st Class. LENGTH FROM SHOULDERS APPROX 37INS. 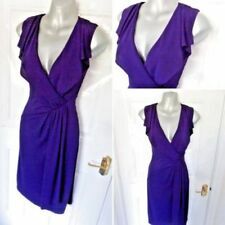 M And S Blue And Red Stretch Wrap Dress Size 12. Condition is Used. Dispatched with Royal Mail 2nd Class. NWOT NEXT Mock Wrap Lightweight Stretch Dress - Size 16. Navy with paisley design. In a stretch Cree fabric perfect for this time of year. Flared short sleeves, notch neck, side ties which give a twisted look very flattering on the tummy and waist area and wrap skirt is fixed so no embarrassing moments! Dispatched with Royal Mail 2nd Class. Please check my other items. Listing lots of new and nearly new clothes. KALIKO chocolate brown stretchy wrapover style 34 sleeve dress size 14. Condition is Used. Dispatched with Royal Mail 2nd Class. Seasalt floral wrap over dress size 14. In bamboo vicose 68%, 27% cotton and 55 elastane so super soft and stretchy. Approx 103 cm long. Ladies *PLUS SIZE 24* black wrap front occasion midi dress *BOOHOO* BNWT Condition is New with tags. Dispatched with Royal Mail 2nd Class. Joules summer dress size 14. Blue with pattern of little white birds - very summery, seasidey and easy to accessorise! Stretch cotton-jersey, ruched cap sleeves, faux-wrap front - flattering & comfortable to wear. Nice quality as usual from Joules. Please see pics and contact me if you need more info. Smoke and pet-free home. UK bids only please and no collections thank you. Postage will be 2nd Class Signed-for. Pretty Little Thing Dress Size 8 . Condition is Used. Dispatched with Royal Mail 1st Class. WORN ONCE. BLACK DRESS WITH WRAP OVER BUST AREA. MACHINE WASHABLE. In a striking floral design. With a crossover neckline and a panel at the side of the waist. Finished with a wrap skirt below. Ultra chic and feminine! And a beautiful thread through buckle. With an attractive frilled fold that falls at the side.